Hand-forged twisted chains, bent beds and large bows… It's all part of the Conestoga wagon legacy. Just as the sweeping curves and graceful symmetry of a heavy Concord Stage Coach allow it to stand out among western vehicles today, the intricate lines and majestic size of the legendary Conestoga wagon make it an equally impressive reminder of America's opening days as a nation. 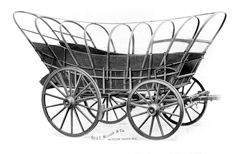 While the Conestoga is not typically thought of as a "western" vehicle, it was among the very first heavy wagons to travel America's primitive roads and trails. As such, it helped grow areas that were considered the "West" in the early development of the United States. Dominating areas from the Ohio Valley and Appalachian Mountain sections to the more populated eastern states, most of these wagons were used in the century between 1750 and 1850. Undoubtedly, there were exceptions to this timeframe, but the span does give us a strong reference to the primary era influenced by these vehicles. 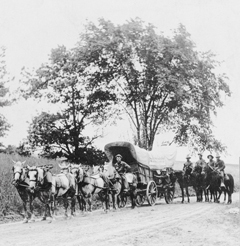 Swiss and German emigrants in Lancaster County, Pennsylvania are generally given recognition for developing these wagons while the name, itself, is taken from the Conestoga River in that area. The river, in turn, received its name from the Native Americans of the region. As large freighters, there were thousands of these "big rigs" daily hauling everything from fruits, vegetables and grain to iron, equipment, clothing and weapons between Pittsburg and Philadelphia, Pennsylvania. The National Road - today's U.S. 40 - included the route from Baltimore to Wheeling, West Virginia and saw equally substantial traffic. Typically a large, heavy carrier, the Conestoga is recognized by its curved bed, raked ends, sizable wheels and network of bows. It has often been confused with more traditional "covered" wagons, schooners and even vintage hay wagons. While there were farm variations, the Conestoga itself was chiefly a freighting vehicle. Notable features include rear wheels measuring between fifty-four and seventy inches in diameter. Front wheels were usually about ten inches smaller and each wheel was attached by linch pins instead of more the modern threaded nuts. To keep the freight from shifting in the rugged terrain they traveled, the bed was bent so the floor had a "belly" that items leaned toward. A Conestoga normally has raked or flared end gates, bow staples, a tool box on the left side, a feed box, linch pin wheels, and extra side rails. 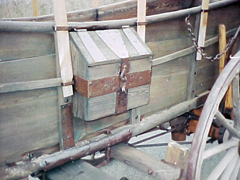 Between eight and thirteen bows held the cover in place and while the wagon is traditionally pictured being pulled by six horses, sometimes there were more or even less. Average loaded weights were in the three to four ton class. However, it apparently wasn't unusual for some of the larger freighters to carry as much as six tons or more. Bill Wiley of Mosheim, Tennessee recently shared photos of a Conestoga he has owned for about a decade. 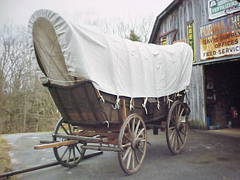 Prior to his purchase, the wagon was in disassembled condition in a private museum. 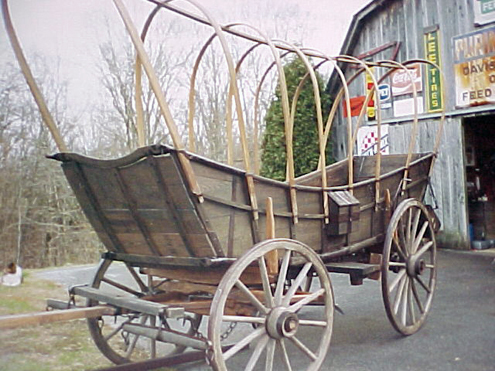 The eight bow wagon is of a typical size and clearly shows the classic curves of a traditional Conestoga. Other original features include a feedbox with double-twisted support chains, lazy board, tool box, axe holder, bow staples, side board extensions and linch pins. While most Conestoga wagons share similar features, the individuality of different maker and user needs sometimes led to variations in styles. Brake levers were usually positioned on the left hand side near the rear wheel. 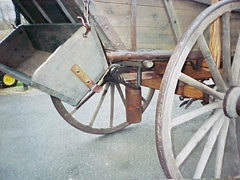 The Wiley wagon has its lever on the left side, but the gear also shows evidence that it had a brake mounted behind the rear axle at one time. This rearmost brake position is also consistent with other documented Conestoga styles. In particular, the rear brake ratchet on the Wiley wagon is similar to that found on the Olney Furnace Conestoga of Berks County, Pennsylvania and the Minnick-Zirkle Conestoga at Colonial Williamsburg. The narrow-tired wheels of the Wiley wagon are a departure from the typical wider tires of the freighters. But, according to Richard Shaner in his 1971 article, "Conestoga Wagons of Berks County," very few Conestoga wagons have survived with their original running gears. As such, it is possible that while the restored gear certainly retains Conestoga features, the wheels may be another 19th century replacement of the originals. 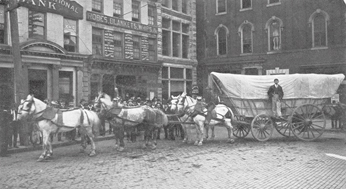 According to Wiley, when he acquired the wagon, the gear was in need of repair and Woodlyn Coach of Millersburg, Ohio helped by replacing axles as well as the front hound, bolsters, and top bows. The iron clouts (metal sheaths positioned on the top and bottom of the axle spindle) were too far deteriorated to be re-used. The Wiley Conestoga measures eleven and a half feet from the ground to the top of the rear bows and the top side panel is fourteen feet in length. Retaining so much original woodwork in the bed along with hand forged ironwork and even original riveting; this is one of an increasingly few Conestoga wagons still held in private ownership. Rarely are pieces like this available for purchase. However, Mr. Wiley recently informed us that the wagon is for sale. Additional information can be obtained by calling William Wiley at 423-422-6032. As distinct in appearance as the Conestoga is, there are other late 19th and even 20th century designs that share similar traits and are often confused with the Conestoga. Lighter weight and considerably smaller, these styles of wagons were often referred to as a "crooked frame wagon", "tobacco wagon", "road wagon" or "southern schooner" by period vernacular and original manufacturer advertisements. 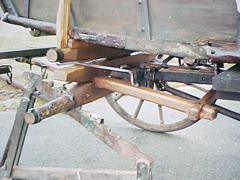 Many times, these bent bed variations were available with either steel cast skeins (the axle surface on which the wagon wheel hub rests/rolls) with nuts or steel cast skeins with linch pins. Winston-Salem, North Carolina had at least two companies building this style of wagon. One was known as George Nissen & Company and the other was the Nissen Wagon Company (J.I. Nissen). There were also other wagon builders in the Carolina's and surrounding areas building similar style crooked bed wagons. But, the Nissen companies are perhaps the best known today. Certainly these wagons share a similar look and likely take much of their design cues from the earlier Conestoga wagons. Ultimately, though, they are lighter farm wagons and not the heavier Conestoga freighters. Bent, bowed, and twisted - the shape of the Conestoga is a powerful example of engineered form following necessary function. Today, these few remaining wagons stand as a tribute to the drive of the early pioneers and their determination to build the American nation. "Conestoga Wagon 1750-1850" by George Shumway and Howard Frey, copyright 1964-1966, 1968. "Conestoga Six Horse Bell Teams" by John Omwake, copyright 1930. "Conestoga Wagon - Masterpiece of the Blacksmith" by Arthur L. Reist, copyright 1975. "The Adventures of a Waggon Tracker" by Franklin A. Zirkle, copyright 2005. "The Old Pike - A History of the National Road" by T.B. Seawright, copyright 1894. "The Conestoga Wagon, Ship of Inland Commerce" by Harry S. Hill - pamphlet copyright 1930 and 1958. Pamphlets and archive materials from various Pennsylvania historical societies. Know of a particularly nice set of wheels or interesting western vehicle story you'd like to see here? Feel free to drop us a line at info@wheelsthatwonthewest.com. We'd love to hear from you!